I bought way too many jelly beans this year. In the grand food blogger sense I only bought 6 different kinds to review, which doesn't sound like an awful lot, but I eat everything I buy. So, in that sense, 6 packages of jelly beans is a LOT for a small household that contains more pets than it does people. 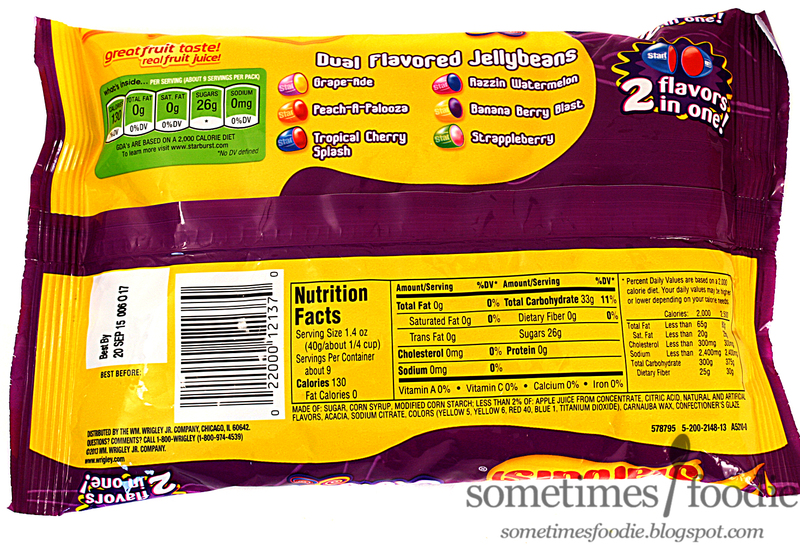 Individually packaged candies are a lot easier for me to toss into a bag and share with others while I'm out and about, but jelly beans are more of a candy-dish kind of sweet, and having candy-dishes when you live with three cats...is not the best idea in the world. Okay so I'm briefly going to go over the packaging. This bag looks more cohesive than the Sweet & Sour Mix, and there's no cut & paste spring or Easter imagery tacked on. The design's not bad, I like the contrast of the yellow and purple, and I feel like this flavor stands out a lot more on the shelves than the rest of the Starburst line. 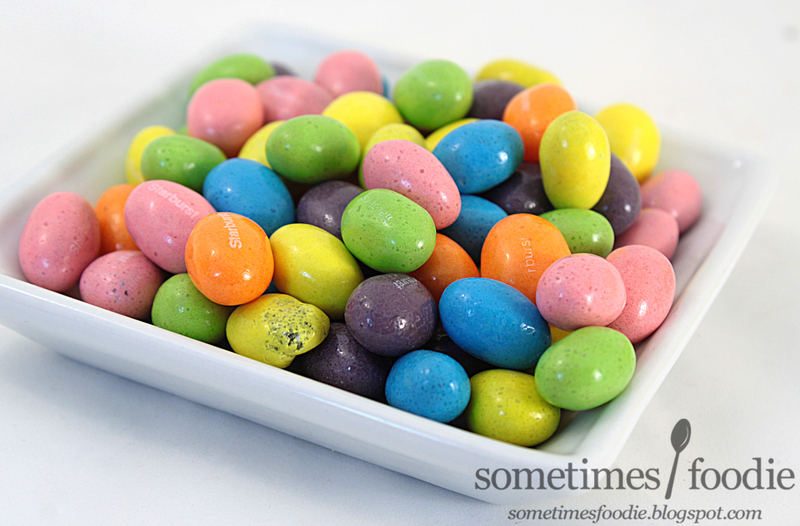 Unlike the original and Sweet & Sour Mix beans, which are translucent and gem-like, these are opaque, speckled, and kind of ugly. There were quite a few oddly shaped beans, like the yellow one seen in the group photo above, which had an uneven coating. 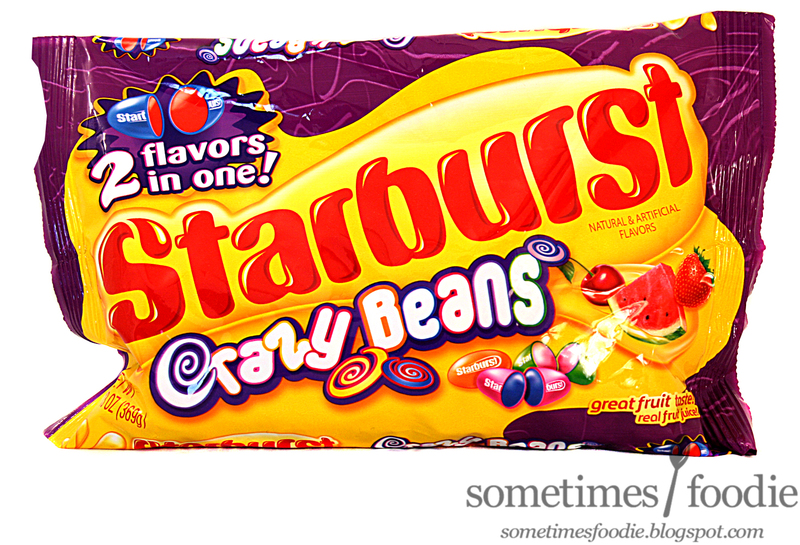 The overall color palette reminds me of the Sweetart beans, but the inconsistent coatings, shape, and size aren't as appealing as the other Starburst items I've photographed. I guess they live up to their 'crazy" name as far as looks, but how do these flavor combinations taste? Razzin Watermelon (pink) - Starts out with some nice, slightly tangy raspberry notes, but as you chew you start to taste the typical artificial watermelon flavoring that a lot of candies use. This combination works out quite well, and this ended up being one of my favorites, although the after taste is a bit on the Chapstick-y side. Peach-A-Palooza (orange) - This tastes just like peach gummy rings and peach flavored Jelly Belly beans. I can't taste anything else. It took me a minute to figure out the name was a play on peach and apple, but once I did I retried a few beans looking for apple flavoring, and I just couldn't find it. Apple is a filler fruit and easily overpowered by other fruity flavors, so maybe the peach flavoring was just too strong. Still, I liked this bean quite a bit too. After eating so many to detect any hint of apple I noticed it started to have a perfume-y flavor build up in my mouth. Not terrible, but a little on the air-freshener side. Banana Berry Blast (yellow) - I love banana, so I was excited for this one, only I found it to be very berry-heavy and not so banana-y. I'm also not too sure what the "berry" in this flavor is meant to emulate. This doesn't come off as any specific fruit to me, these are pretty artificial and generic. Not bad, but not great. I wish these had more of a powerful banana flavor, but they really aren't bad. Strappleberry (green) - Oh man, remember Strappleberry Juicyfruit gum? I used to buy it like crazy when I was in high school, but I honestly don't remember what it tasted like. I was hoping this bean would jog my memory, but no such luck. 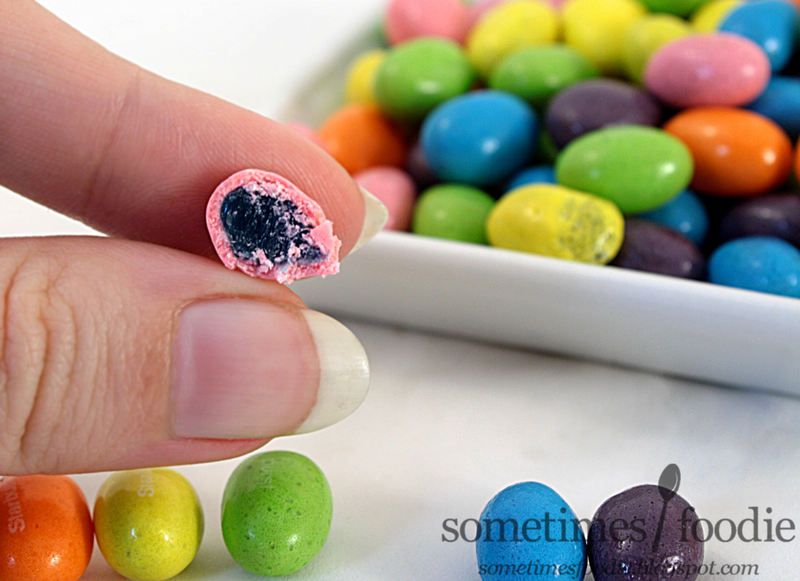 It's sweet, artificial, and a bit like watermelon Bonne Bell chapstick. The more I ate the more this one started tasting like green apple to me. I fear these crazy beans are living up to their name and making me lose my mind. Tropical Cherry Splash (blue) - Okay, what is this mashup even supposed to be? The name doesn't say much, but the flavoring seems like some kind of maraschino cherry and pineapple. It's sweet, a little tangy, but I don't really know how I feel about it. It's refreshing in a way, but it wasn't a bean I found myself reaching for by choice. I eat them because they are there. Grape-Ade (purple) - Pretty heavy on the grape, and light on the lemonade. We all know my feelings on grape flavored candies at this point, and this was no different. Easily my least favorite flavor in the entire bag and I avoid them. 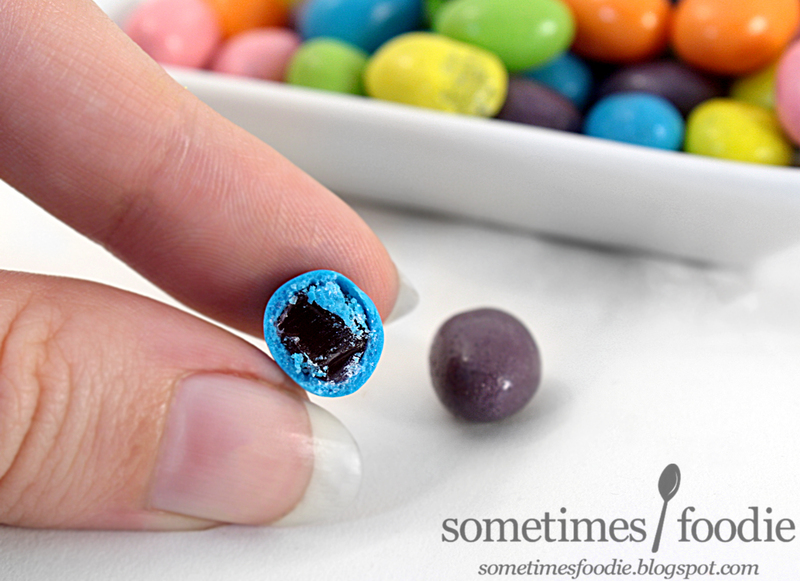 Worthy of having it's own Jelly Bean Version? : Sure! 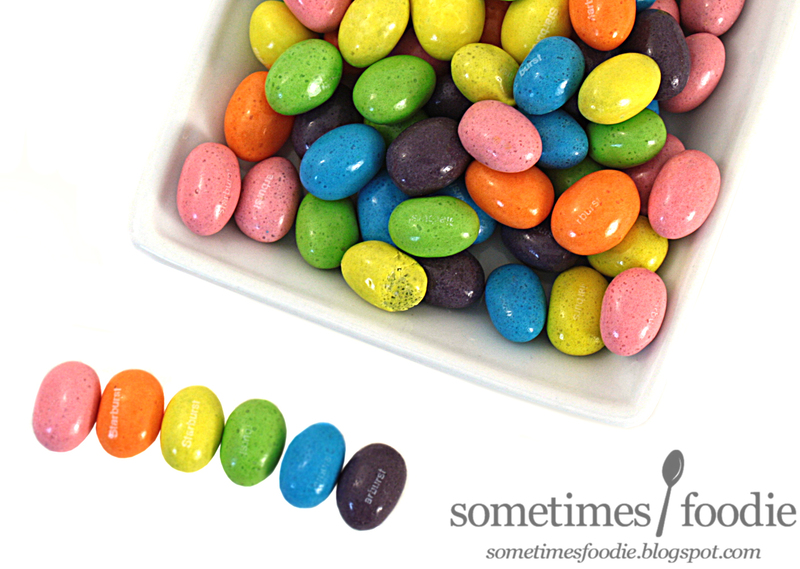 These are differently flavored than any other bean on the market and for the most part they taste great. They might not be as pretty as the other jelly bean options, but I think this is a pretty great product. I could see myself buying these again next year, but I'll personally be picking out all the Grape-ades.